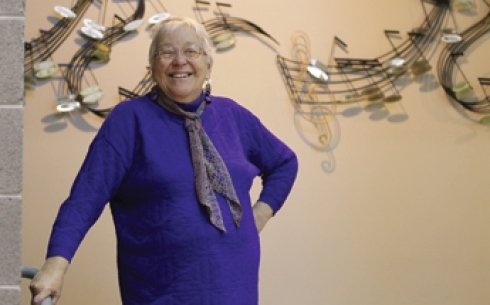 For 35 years, Rita Simó, the founder of the People’s Music School, has run her Uptown school in accordance to her belief that all music lessons should be—and can be—free. Photo by J.Geil. In 1976, Juilliard-trained pianist Rita Simó hung a sign outside a grungy old Uptown beauty salon, offering free food and beer to anyone willing to help her clean it up. Six hours and 18 volunteers later, all the caked-on hairspray and grime had been scrubbed away, making room for free music education: the People’s Music School. Simó, the founder, is quick to point out that this institution is not hers alone—but a school built by the people for the people. The volunteers who helped clean the salon were among the first to enroll their children in the school’s first class of 45 students. Thirty-five years later, parents line up around the block at the crack of dawn to register their children, knowing that enrollment, while free, will be an investment not only in their child’s education but also in the school as well. With 300 students, 29 paid teachers, and no tuition or fees, the school relies on the generosity of donors and the efforts of parents and children through fundraising and volunteer work. Teachers like Carter Hoyt, who joined the staff fresh out of college in 1976, have stuck with the school even when it had no money for salaries, and Simó recalls devoted students collecting pennies and dimes to contribute to biannual fundraisers. Simó sums up the school’s philosophy simply: “You have to share your goods. You cannot keep it for yourself.” As Simó reasons, she got her own music education for free, thanks to her native Dominican Republic’s education system and a scholarship to the Juilliard School, so why shouldn’t she return the favor? This spirit of hard work and philanthropy, along with the school’s intense music regimen, has produced doctors, teachers and doctorate-degree earners. Some students have leveraged their experience into music careers. One alumnus, Alan Pierson, was recently named artistic director of the Brooklyn Philharmonic. The Chicago Reporter sat down with Simó to discuss the impact of the People’s Music School. What inspired you to open the People’s Music School? I realized that in this country if you didn’t have money, you couldn’t learn. My education in the Dominican Republic was all free, and when I came here, I had a scholarship from Juilliard—it was all free. So I was determined that I should pay it back, and this is why the school started. In the Dominican Republic, they believe a person should develop a talent, so we have a free school for dance, for theater and all kinds of conservatories for music. Art was part of your education. If you’re a human being, you should develop whatever talents you’ve got, and that was it. In this country, it’s not like that. I mean, you can develop it if you have money to pay, so that’s why this place is free. When you talk about democracy, democracy for me means that everybody should have the same opportunities. What challenges did you face putting this school together? Never having enough money for anything. Always begging people to help me. Learning how to write proposals—that was one of my biggest challenges. But, you know, there is always a challenge. Things are not going to come to your hands unless you put up with some things. I heard this conversation, and then I sat down and I said, ‘This lady is asking for $10, and here I am upset because I didn’t get $100,000. What’s different between she and I?’ And the difference is that she’s still begging for it. So you know what I did? People thought Rita had cracked up. I wrote an ad in the Chicago Reader, and it said, ‘The People’s Music School is looking for a hundred persons that are willing to donate a $1,000, or a thousand persons who are willing to donate $100 in order for us to finish our building. If you want more information …’ Then I put the school, the address and all of that. I sent it to the Reader. Do you know how much money I made? $67,000 from people that I didn’t know anything about—complete strangers. So ask, and you shall receive. Of course, as I began to tell the story about that, more people gave us money. We moved into this place in September of 1995, and I was able to finish paying all the business of the school in January of 1996. What are most students’ social background? They’re from the neighborhood. They’re [Asians], they’re Latinos, some white, some black. There might be one or two people who have a good social background—money—but I would say 90 percent are very poor. We treat people here as equals, no matter your color, your size, what language you speak, who you go to bed with—it’s none of my business. Not now, but there have been moments when people said, ‘How do you know that the people you have here are not gay?’ And I said, ‘Why do I need to know that? I’m not going to bed with them.’ There are people like that. Others say, ‘Do you know that you have students that are Jewish?’ I say, ‘So? I have some that are Christian, too, and some that don’t go to church at all. What difference does it make?’ If you follow the little rules that we have here, that’s all there is to it. We don’t ask how much money they make, but we are very precise: Every [parent] here has to do at least two hours of volunteer work a month, and that’s it. Whether you are a lawyer or a cook, we treat you equally: two hours. Even if you are a doctor and you charge $50 for half an hour of your time, you may be giving us equal to several hundred dollars, but you still have to give that time to us. Money does not cover it. Sometimes [parents] look at me and say, ‘She’s an old lady. We can get away with whatever.’ One time, we had a registration, and [46th Ward Alderman] Helen Shiller was in line, because she wanted her granddaughter to study flute. Somebody went to her and said, ‘What are you doing in line? You should go there and tell Rita that you’re here.’ Helen just looked at that lady and said, ‘Do you know Rita?’ The rules are for everybody. Do the students have a hard time relating to classical music, with its high-class associations? When [the students] talk to me about high-class classical music, I sit at the piano and play a merengue, and they say, ‘Huh?’ Music is music, whether it’s, ‘I’m Dreaming of a White Christmas’ or the songs from [George] Gershwin. It’s those kinds of songs that some people consider classical and that others don’t consider as anything. It’s all one. Music is music. There are seven notes, and that’s all there is. What qualities does a music education instill? There’s a pride. It’s your creation. Whenever I play for parties and stuff, I ask people to give me a tune, and then I improvise in that tune. It’s creating something. One of the things that we see specifically in kids that come through here is discipline. They learn that if they want to accomplish something, they have to put some time into it. The result of that is that we have many, many former students that are doctors and teachers. They are not necessarily in music, but there are some music teachers as well, and there are also people in orchestras and people who created a [musical] combo or groups like that. Do you think a school like this could be replicated elsewhere? I think so, if you’re willing to put up with all the crap. It’s not easy. The fact is that there are schools that charge money, and they tell me—and I understand what they’re saying: ‘If we don’t charge money, we will not have students, because where are we going to get the money from?’ We have a woman whose job is to write proposals so we can have enough money. It costs $1,500 per student per year to have class. It’s a lot of money to raise. To learn more about the People’s Music School, go to www.peoplesmusicschool.org.